Showing items tagged with "inbox zero" - 19 found. Move all emails over two weeks old to a folder outside your inbox. Basically anything that old is well past its sell-by date. If it isn’t you can be sure that the sender will re-contact you. Start the folder name with full stop and it will sit at the top of the folder list. Alternatively for Outlook users, you can add it to your Favorites. Review what is left and decide what else to move out and what still needs action. Use the Conversation view/Sort by Subject/Sender etc to sort. Set aside time each day to action any emails which really, really warrant your attention. Highlight those for attention after the break (move to a ‘Pending’ folder, create a task etc). With many people in festive mood, some emails might gain more attention if left until January 2nd! Move all the remaining emails out to the folder created in Step 1. By now you should have a relatively clean inbox. If not – simply declare Email Bankruptcy. Still too many emails in your inbox and no place to put them? Why not ask Mesmo Consultancy to run a Smart Email Management Masterclass in the new year? Email is over 30 years old and hasn’t changed that much since its inception. But over the years we have been letting it take over our lives. It started out as a basic electronic messaging system, and we now use it to communicate everything – from the simplest to the most complex messages. 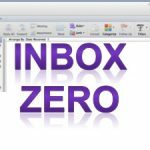 This blog reviews some of different approaches to managing email overload and their pros and cons, including inbox zero and the goldfish techniques. For the last five years, Inbox Zero was the holly grail for many who wanted to save time dealing with email. But did it really help and reduce email overload? Is your business email etiquette and social media footprint helping or hampering your chances of a new job? How quickly can you spot fake news? These are some of the topics we highlight for this month. 1. What is the best way to manage your inbox and email overload? 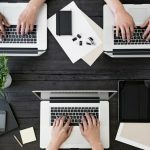 Over the years many different approaches to email management have been touted as the salvation for everyone suffering from business email overload. These include Inbox zero which many pursued as the holy of grail of business email management. Now Merlin Mann its inventor doubts its effectiveness and suggest that it might indeed be a complete waste of time. So what are we left with, the sledge hammer or goldfish approaches? In this Guardian guest blog, Monica reviews the options. 2.Eight email (etiquette) mistakes which bug your colleagues. Adding kisses and emoticons, not including a greeting and informal content are just some of the things you might be doing with email which annoys your colleagues. This is what a recent study by CV-Library revealed. Sending emails well out-side normal office hours is also very annoying. None of this is new but these are also business email etiquette habits which might be costing you your next job (including when emailing recruitment companies). Check your business email etiquette using the Mesmo Consultancy on-line analytical tool. It is so easy to fall into sloppy habits as we work under increasing time pressures. Make sure this is not happening to you and that your business email etiquette is not jeopardising your next job. 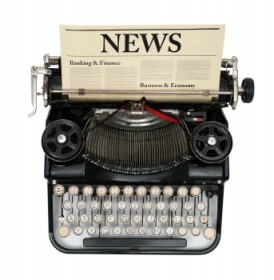 For more tips see the Mesmo Business Email Etiquette video the Five S Formula for Writing Effective Emails. 3. Deep clean your internet activity. Yes, the first port of call for recruiters is often the internet. What will they find out about you? Old social media posts which you forgot to remove. One of us was recruiting for a CEO. After finding information about a potential candidate they phoned a business associate who might know more. Yes, you guessed, the candidate did not make it past the first round. You cannot remove all the content for example reputable news content. However, you can clean up your social media posts as this article explains. 4. Corporate leaders: keep your Yammering in check. It is not just the Millenials and Snowflakes that need to be mindful of what they post on the web. CEOs too can sometimes wreak havoc with their posts as Jean- Sébastien Jacques CEO of Rio Tinto found. It is easy to get carried away by the ease of posting and one’s own self-importance. In the process as Mr Jacques and others have found they can reveal too much personal information and sensitive data which causes mayhem. On the other hand there is a line of thought which says there is no such thing as bad publicity. It’s a very fine dividing line as these articles have demonstrated and which need treading with great care and attention. 5. Spotting fake news. Pre the web, we used to say there are lies and dam lies. We were taught to study the statistics used and look for inconsistencies etc. Whilst this is still a vital skill, the challenge is how to spot news on social media which is fake. Here is an excellent concise guide on how to do it. About to take a few days out of the office? Here are give top tips to avoid coming back to a chronic attack of business email overload. Reduce the current inbox to as near to inbox zero as possible – see 2 and 3 below. 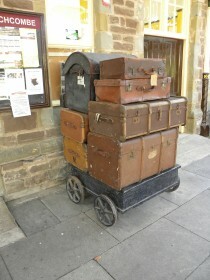 Check for any important emails which if left unattended will be urgent when you return. If there are then either deal with them now or send a holding reply which allows you time on your return to deal with them. Move out all the remaining emails over a week old. They are past their sell by date and if they are not, rest assured, someone will re-email you. You should just be left with emails needing attention on your return. You could be bold and move these too into a folder ‘awaiting action’. Now you have an empty inbox. How does that feel? To keep the inbox clean and de-cluttered see item 4. Set up rules to move automatically both essential and non-essential emails to folders eg newsletters, circulars, out of office messages, emails on which you are cc’d, etc. This also means that emails from key people are all in one place on your return and easy to find. Your inbox should then just contain important emails but un-planned for emails. Set a safe and simple Out of Office message. Take care not to leave the door open to prying eyes and cyber criminals. You might be bold and suggest the sender re-sends any important emails on your return as all emails will be automatically deleted. Such a practice is far more common than you think. Now go off and relax safe in the knowledge that you have taken adequate precautions to reduce a chronic attack of business email overload. 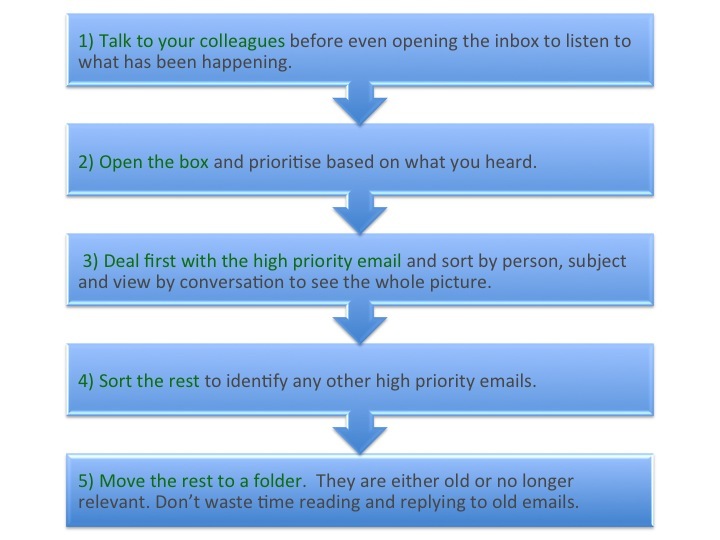 For more guidelines like these see Brilliant Email and Taking Control of Your Inbox (the latter is especially relevant for PAs and EAs who manage someone else’s inbox. "'After participating in Mesmo Consultancy’s ‘Brilliant Email’ workshop, we no longer feel our inboxes are king; simple but effective tips have saved us up to 30 minutes per day. We have also been enthused to better understand how we interact with both internal and external customers, building on our relationships in ways that are not exclusively electronic. Monica was an engaging and knowledgeable trainer who we would highly recommend to anyone who feels chained to their email.' Bethany Fovargue, Data Interchange"